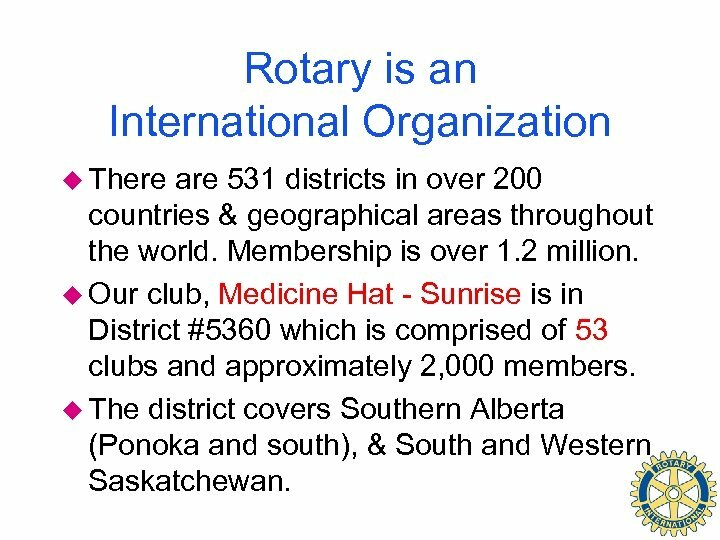 Rotary is an International Organization u There are 531 districts in over 200 countries & geographical areas throughout the world. Membership is over 1. 2 million. 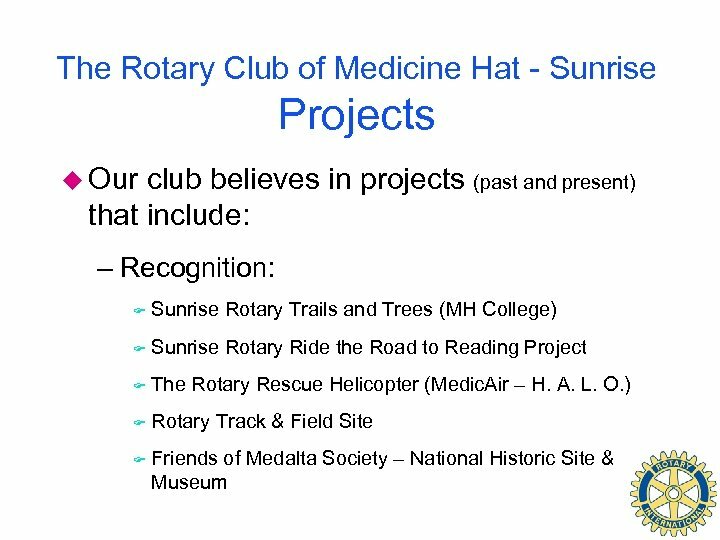 u Our club, Medicine Hat - Sunrise is in District #5360 which is comprised of 53 clubs and approximately 2, 000 members. 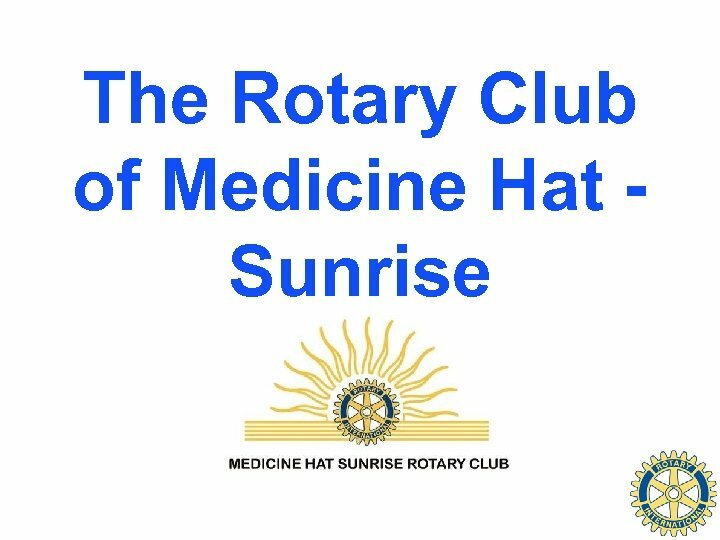 u The district covers Southern Alberta (Ponoka and south), & South and Western Saskatchewan. 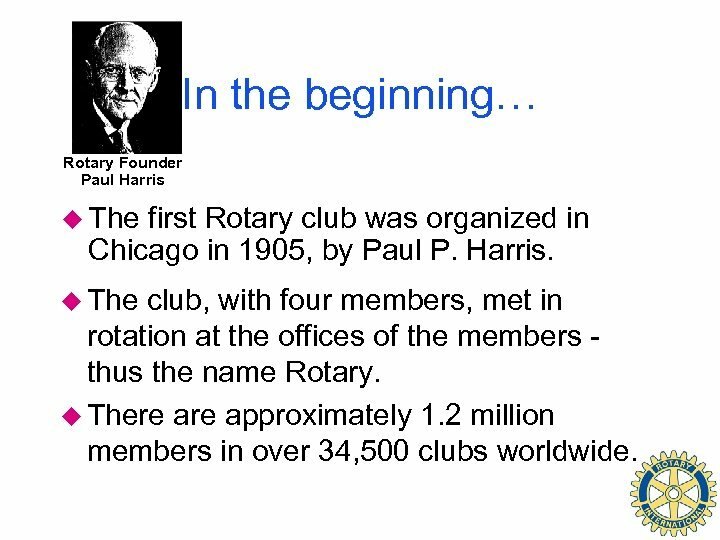 In the beginning… Rotary Founder Paul Harris u The first Rotary club was organized in Chicago in 1905, by Paul P. Harris. 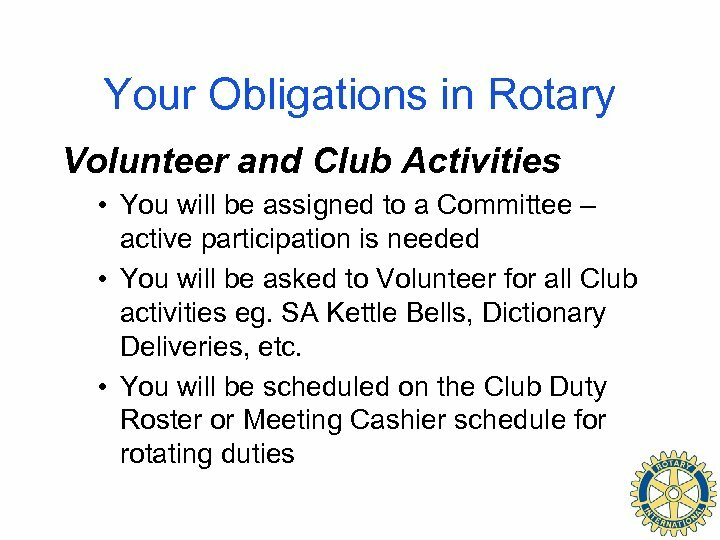 u The club, with four members, met in rotation at the offices of the members thus the name Rotary. u There approximately 1. 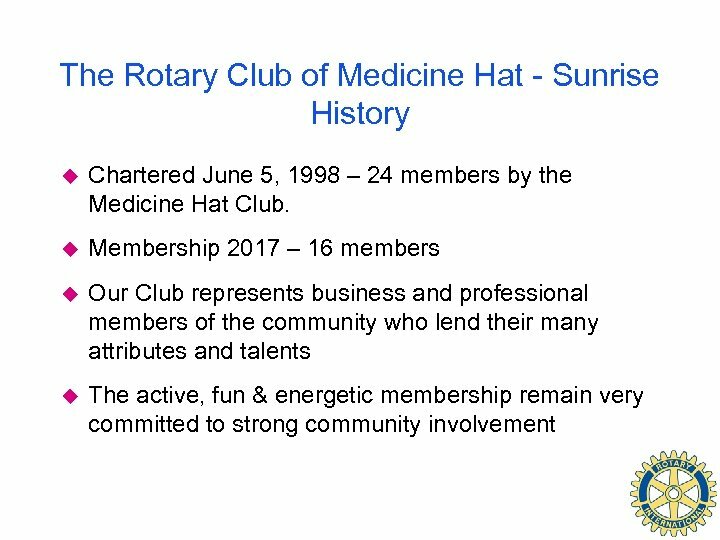 2 million members in over 34, 500 clubs worldwide. Service Above Self u Rotary was not long to recognize that fellowship alone would not keep a group together — there needed to be a purpose. u The first service project was public restrooms in downtown Chicago, IL, USA. 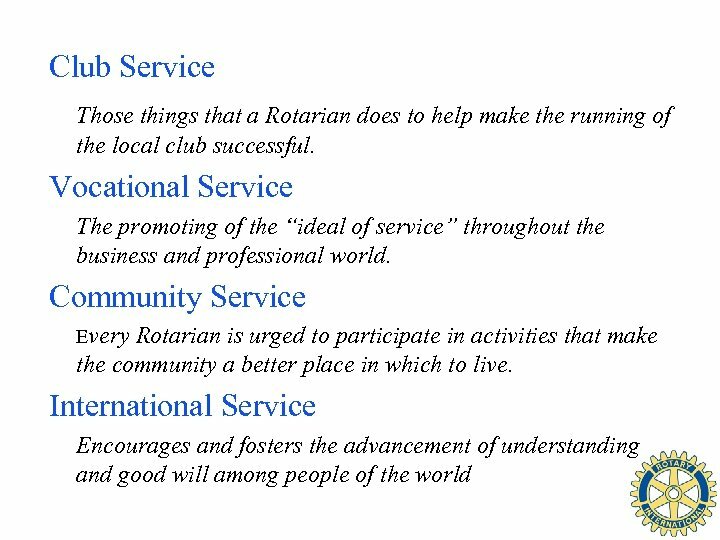 u Rotary became the world’s first service club. 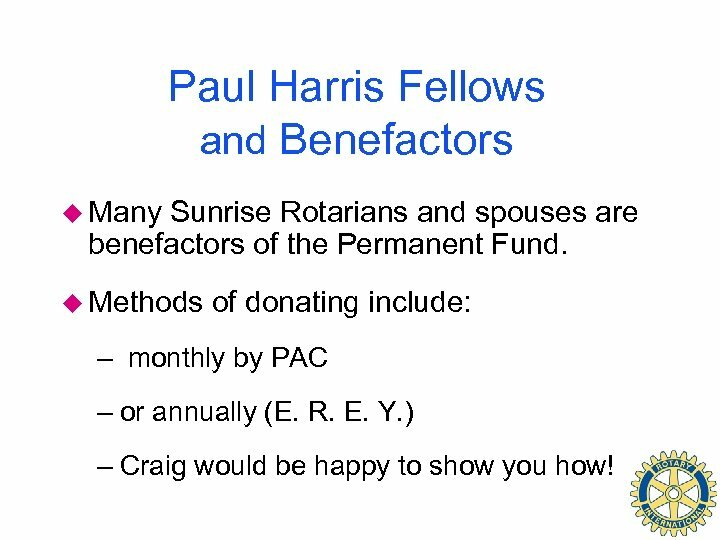 Paul Harris Fellows and Benefactors u Many Sunrise Rotarians and spouses are benefactors of the Permanent Fund. 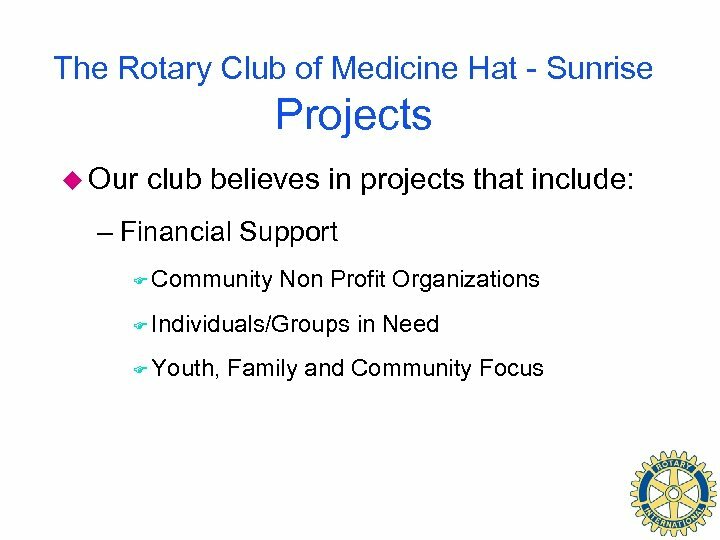 u Methods of donating include: – monthly by PAC – or annually (E. R. E. Y. ) – Craig would be happy to show you how! 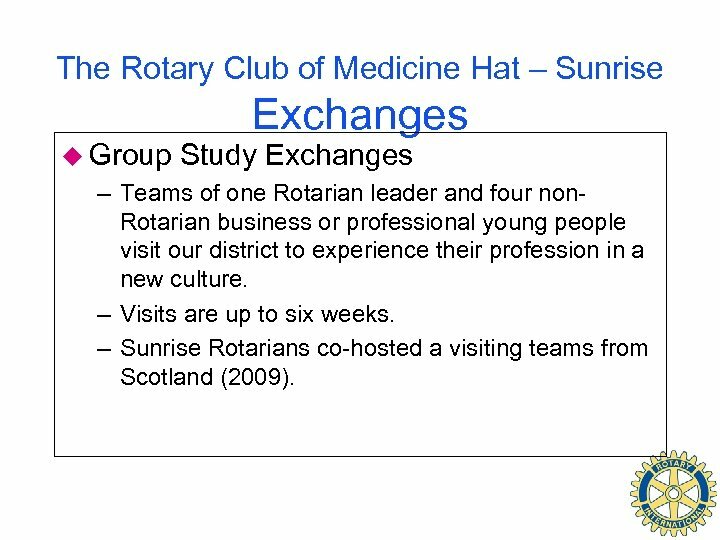 The Rotary Club of Medicine Hat – Sunrise u Group Exchanges Study Exchanges – Teams of one Rotarian leader and four non. 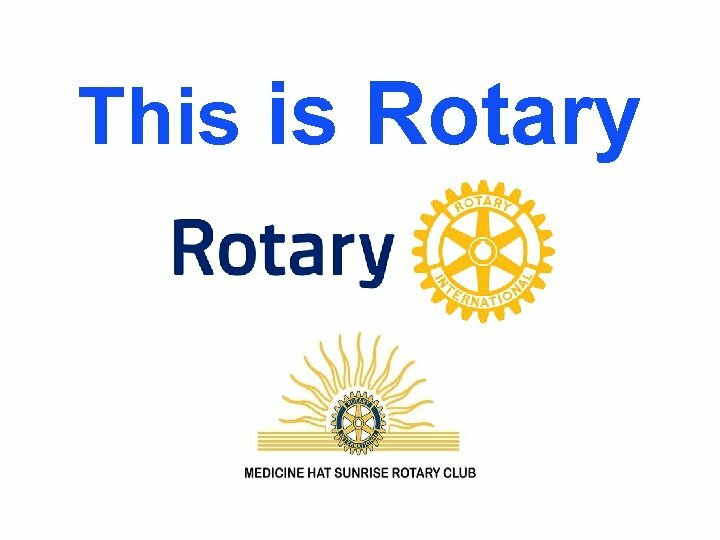 Rotarian business or professional young people visit our district to experience their profession in a new culture. – Visits are up to six weeks. 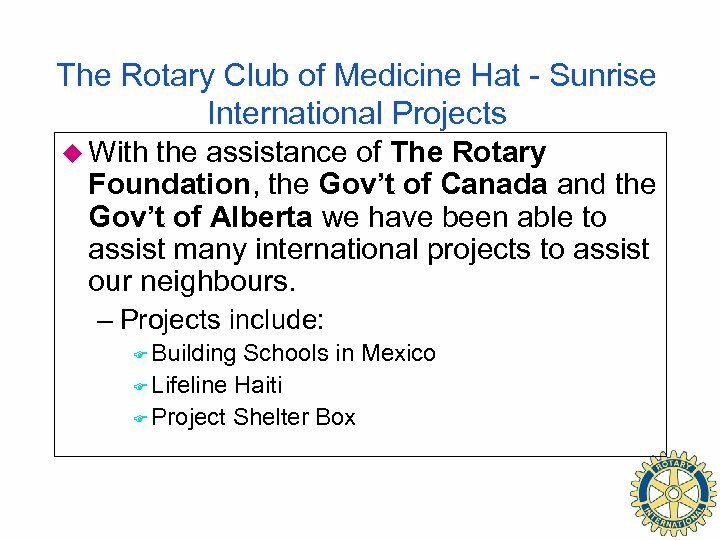 – Sunrise Rotarians co-hosted a visiting teams from Scotland (2009). 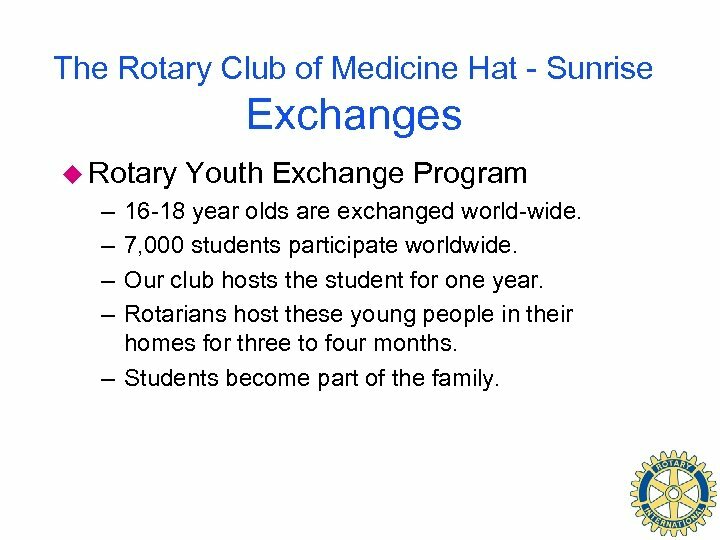 The Rotary Club of Medicine Hat - Sunrise Exchanges u Rotary – – Youth Exchange Program 16 -18 year olds are exchanged world-wide. 7, 000 students participate worldwide. 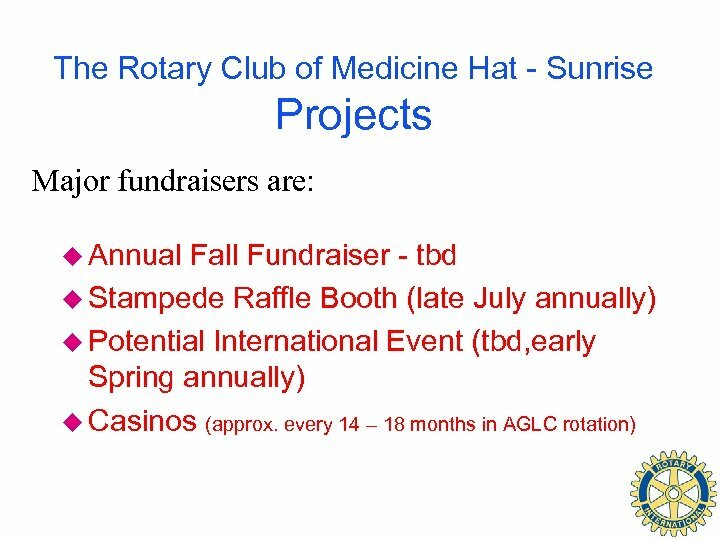 Our club hosts the student for one year. 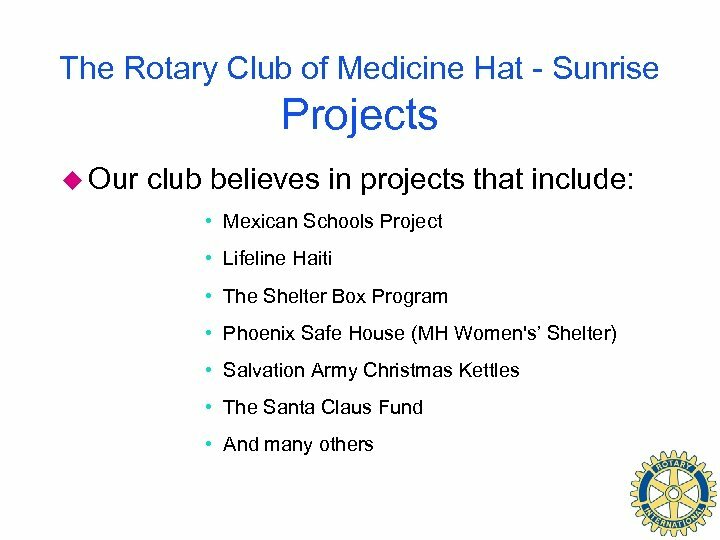 Rotarians host these young people in their homes for three to four months. – Students become part of the family. 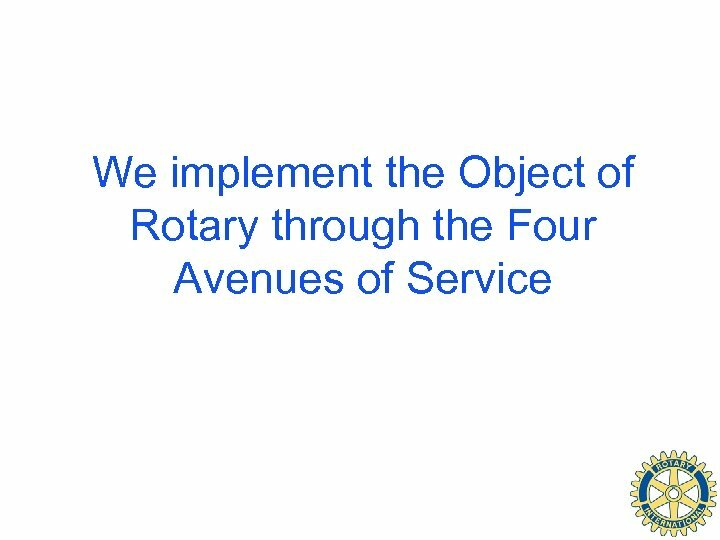 Object of Rotary u The Object of Rotary is to encourage and foster the ideal of service as a basis of worthy enterprise. 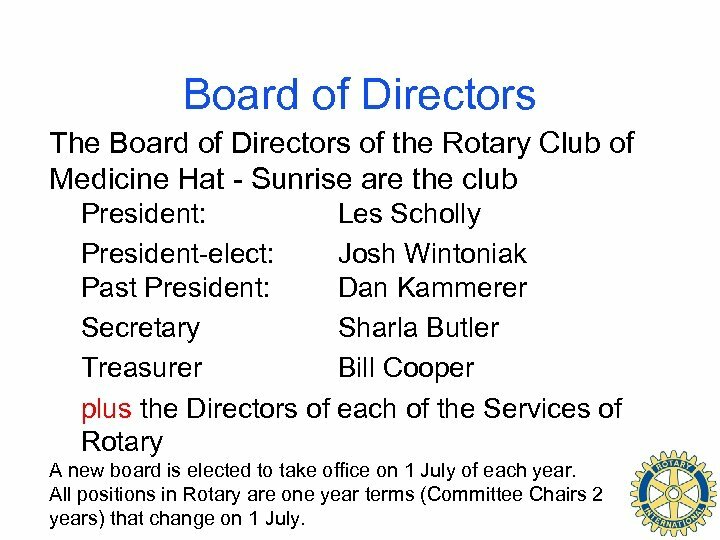 Board of Directors The Board of Directors of the Rotary Club of Medicine Hat - Sunrise are the club President: Les Scholly President-elect: Josh Wintoniak Past President: Dan Kammerer Secretary Sharla Butler Treasurer Bill Cooper plus the Directors of each of the Services of Rotary A new board is elected to take office on 1 July of each year. 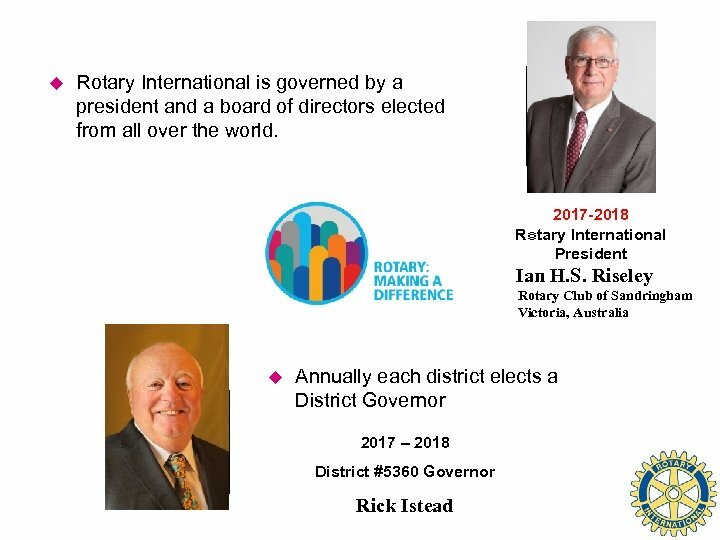 All positions in Rotary are one year terms (Committee Chairs 2 years) that change on 1 July. 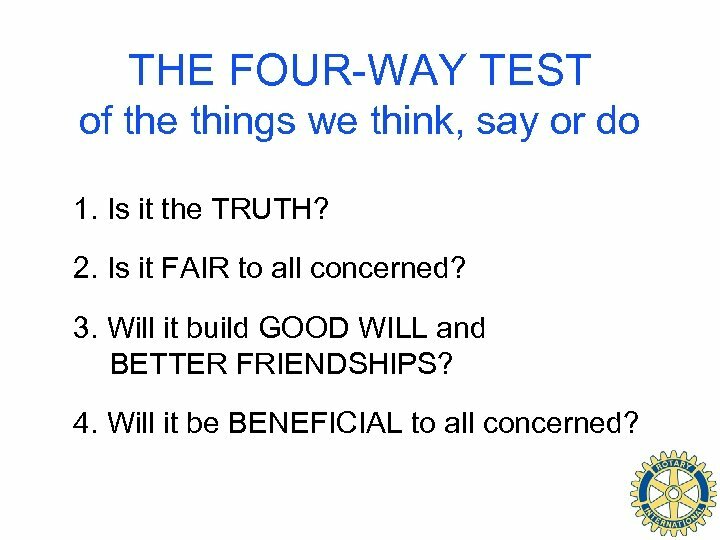 THE FOUR-WAY TEST of the things we think, say or do 1. Is it the TRUTH? 2. Is it FAIR to all concerned? 3. Will it build GOOD WILL and BETTER FRIENDSHIPS? 4. Will it be BENEFICIAL to all concerned? 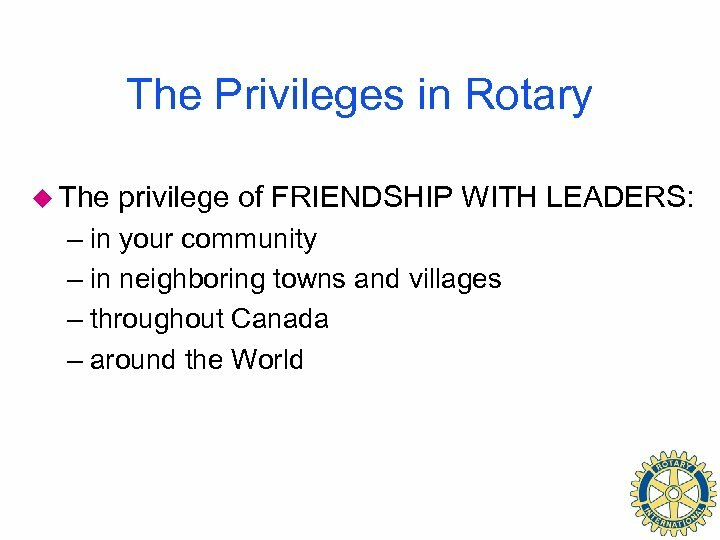 The Privileges in Rotary u The privilege of GIVING SERVICE to your community. 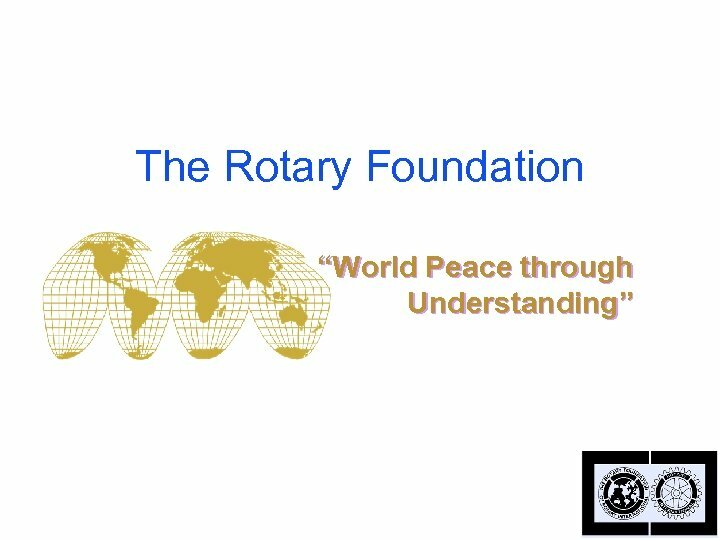 u The privilege of DEVELOPING INTERNATIONAL GOODWILL and understanding. 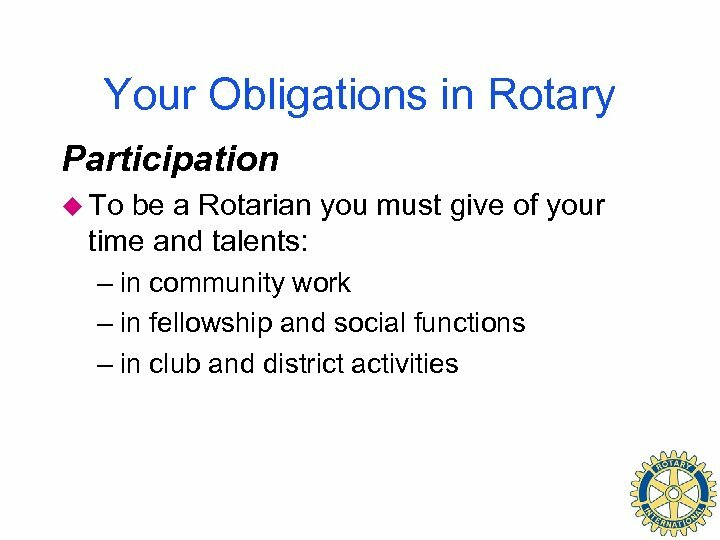 u The privilege of helping BUILD HIGHER ETHICAL STANDARDS within your vocation through the common bond of Rotary. 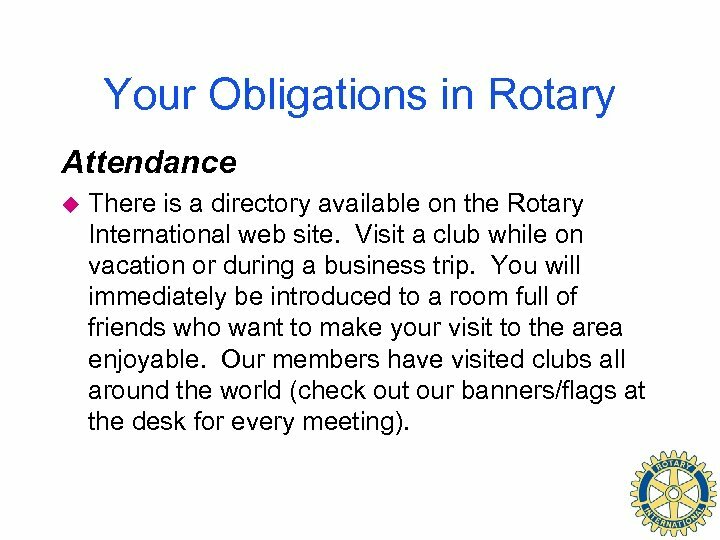 Your Obligations in Rotary Attendance u There is a directory available on the Rotary International web site. 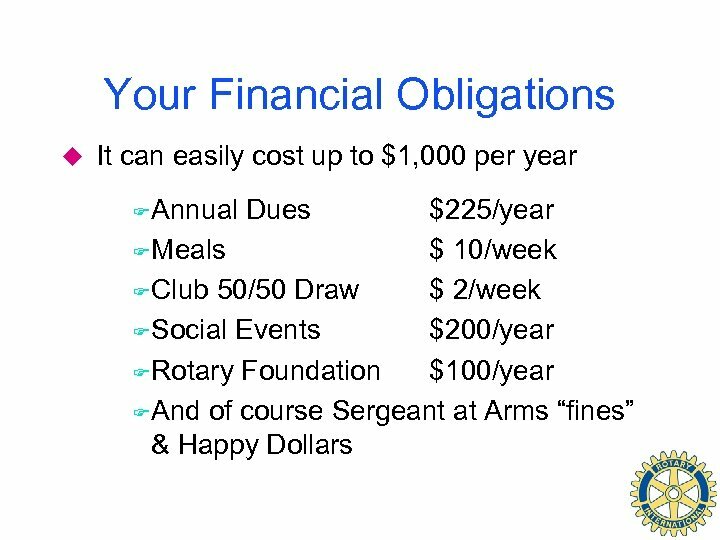 Visit a club while on vacation or during a business trip. You will immediately be introduced to a room full of friends who want to make your visit to the area enjoyable. Our members have visited clubs all around the world (check out our banners/flags at the desk for every meeting). 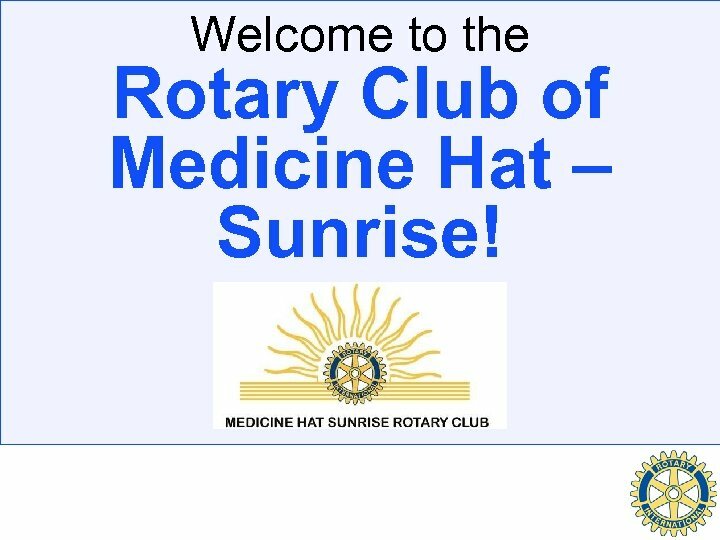 Welcome to the Rotary Club of Medicine Hat – Sunrise!